This post was written in partnership with The Children’s Book Review and the EW Foundation, Inc. Opinions are my own. Are you as shocked as me by the manners (or lack of) that many people have these days? While it's certainly easier to teach manners to people when they are young, I have been craving a resource that puts it in a fun, easy-to-present way for kids. 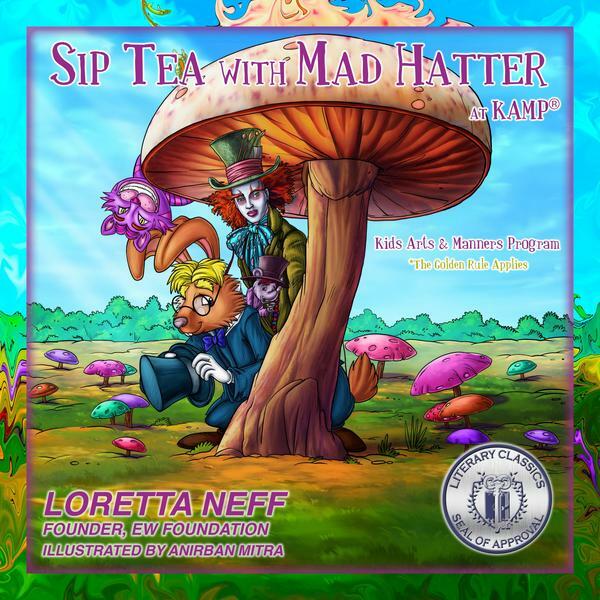 That's why I was a bit taken aback at the thoroughness of Sip Tea with Mad Hatter: At KAMP®, a book written by Loretta Neff and illustrated by Anirban Mitra. The book, which includes a forward with teaching guide for parents and teachers is a delightful look at manners, or as I learned them growing up "The Golden Rule." So, you can imagine how excited I was to see that KAMP (Kids Arts and Manners Program) has the motto "The Golden Rule Applies." Really? A fun book in the spirit of Alice in Wonderland, but with a focus on treating others the right way? I'm in! 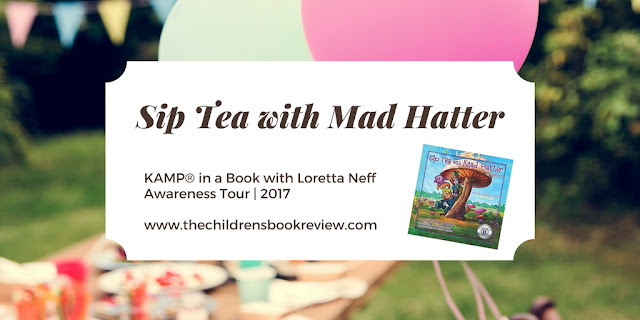 Sip Tea with Mad Hatter makes learning afternoon tea manners fun, meaningful, and most important, memorable. 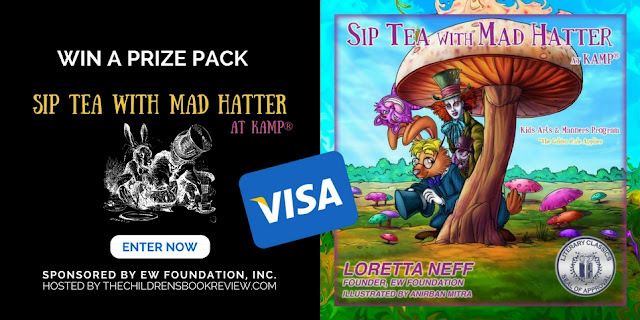 Any adult or child who reads this book will delight in the clever illustrations and correlations of Alice in Wonderland’s characters to the manners advice. Designed for kids ages 6-12, I think even younger kids can learn from it. I love that there is a glossary in the book for "important terms", such as "please" and "thank you." There are fun historical facts, such as where teatime ceremonies came from. The illustrations are colorful and bold, and the format of the book allows you to break up the reading into small sessions so that kids can learn one related topic at a time. One section teaches kids how to sit nicely at the table and use good dinner manners. Another section offers creative ways to show "thanks." Yet another instills confidence in kids through standing up straight and using positive self-talk. I really do think this is a good program for home, daycare, or classroom use. It's really unlike anything I've seen, and I'm happy to have received a review copy to put on our family's bookshelf! Learn more about this book at the official websites www.theelegantwayfoundation.org and www.sipteawithmadhatter.com. You can also find out more on Facebook and Twitter! And don't forget to see the other blogs participating in this tour here. Wanna Win? You could win an autographed copy of Sip Tea with Mad Hatter: At KAMP®, by award-winning author Loretta Neff; plus a $25 Visa gift card to buy supplies for your own tea party! Giveaway open to US and international mailing addresses. Prizes provided by EW Foundation, Inc. Respect is very important! With learning respect , they learn a lot of other mannerisms. I think the most important social skill you can teach your children is empathy. When they are able to understand that everyone is different and that is what makes everyone special, they do not tend to see what most people see as negative. I think manners and respecting their elders is something they should all do. Teaching children good manners is very important. Teaching kids to have respect, good manners and politeness.